Yesterday I took my six-year-old daughter to see Captain Marvel. She really wanted to see Alita Battle Angel, but I told her she wasn’t allowed to see Alita Battle Angel because I heard it was too violent and it looked boring. So I talked her into Captain Marvel and she was so inspired by the movie that now all she wants to do is play “Captain Marvel” which is a game she invented where she just yells “I AM VERY POWERFUL” and repeatedly tries to kick me in the nads. I was a little worried about Captain Marvel being too adult for her with its PG-13 rating, but the biggest problem was that, as a kindergartener, she couldn’t really follow the plot. To be fair, I’m 35 and also had a hard time following the plot. Too many shape-shifting double-crosses for my middle-aged brain. What she did like was all the punching Captain Marvel did, which she enthusiastically demonstrates by trying to photon blast my zone. Internet garbage boys are complaining that Captain Marvel has a man-hating agenda, but having seen it I disagree. To me, the film is about being your truest self and ignoring others’ expectations of you. I thought that part was really moving, even if I couldn’t always follow which aliens we were supposed to be rooting for, and even if it’s inspired my six-year-old to wage a non-stop melee assault on my crotch. There is one joke specifically at the expense of men, but honestly? It’s a good joke. So I don’t think there’s a secret anti-male campaign behind the film, and the fact that my daughter won’t stop violently attacking my testicles is probably just a coincidence. 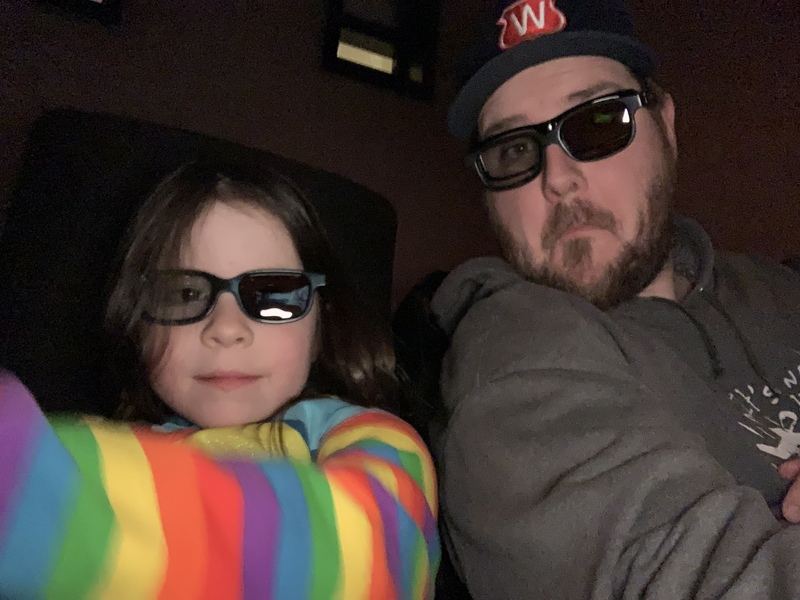 As shown in the above photo, this was also my daughter’s first 3D movie, which she did not care for as an effect, but did like wearing glasses. It prompted a fun discussion on what the different numbers of dimensions mean. I’m curious what dimension covers pain caused by a six-year-old bag-tagging you while you try to eat popcorn. My daughter also insisted on staying for the post-credits scenes, and then she made me explain the entire last decade of Marvel movies to her so she would understand them. This was a challenge because there are a lot of Marvel movies and my brain is bad. She said she wanted to watch the other ones, but only the ones about girl superheroes. Then she full-on Karate Kid crane-kicked me in the balls. Captain Marvel is a really fun time at the movies.